Mr said necessary funds would be given at the earliest for construction of over 20 police stations in the three districts and asked the State government to expedite the work. Iy must be mentioned here that the State government had sent a proposal for setting up an ITBP battalion here, Mr. Singh said, adding he had asked his Ministry’s officials to immediately examine it. He also promised to sanction a forensic science laboratory in the State. “We will do whatever is possible in the interest of the State for development. There is no dearth of funds. But every penny from the Centre should be judiciously utilised to maintain transparency so that nobody could point a finger,” he said. Four State roads have been announced as national highways and the State government should send proposals for early sanction, Mr. Singh said. 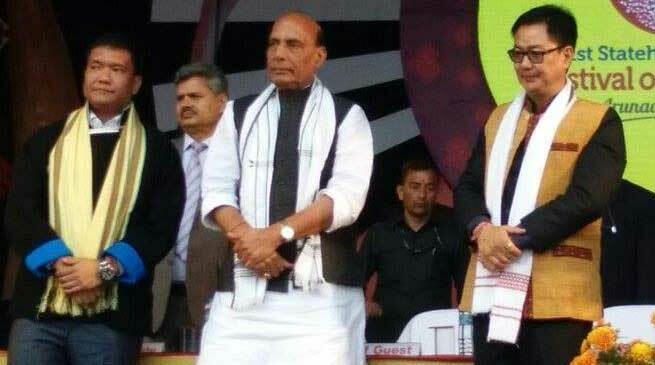 He said the foundation stone for a railway line to Pasighat would be laid soon.Referring to the hydro power potential of the State, Mr. Singh said a robust connectivity infrastructure was a must to tap this and turn it into a money spinner. Union Minister of Road Transport and Highways Nitin Gadkari had already announced a ₹50,000 crore project for roads and bridges in the State. To boost telecom and IT connectivity, work on band line for 5035 km is on. Ducting has been completed for 2300 km, while cables have been laid for 1300 km. Referring to the aviation sector, the Union Minister said the Centre had already given 75% subsidy for two MI-75 choppers in operation in the State, while subsidy for another small chopper would be approved soon. “Commercial flights will be made operational from Pasighat Advance Landing Ground (ALG) soon,” he added. On CM Pema Khandu’s decision to make official work paperless, he said it would bring efficiency and transparency . In the recent Vibrant Gujarat Summit, many investors wanted to invest in Arunachal, he said.